On the horizon from the left are: Eel Crag; Coledale Hause with Causey Pike in front, Sand Hill, Hopegill Head; Grisedale Pike with Barrow beneath it; Hobcarton End; Whinlatter; Lord's Seat; Barf and Sale Fell beyond Bassenthwaite; Dodd; Long Side and Carl Side; Skiddaw; Lonscale Fell; Great Calva; then the lower slope of Blease Fell, Blencathra. Castlerigg Fell appears in the middle distance on the left leading the eye to Keswick. 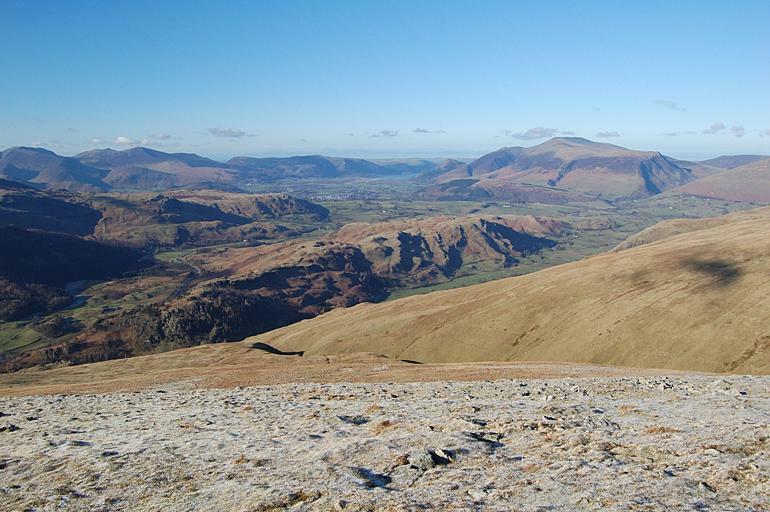 The road north from Thirlmere to Keswick can be seen between Castlerigg Fell and High Rigg, and the valley of St John's in the Vale completes the middle ground. Smaller version of this picture.